Carroll History’s lineage chart begins in Augusta County, [then it was a part of] Botetourt (1769), Fincastle (1772), Montgomery (1776), Wythe (1790), Grayson (1793), Carroll (1842). Carroll in 1845 annexed a portion of Patrick County and another part in 1854, now known as Fancy Gap District. Mr. John Carroll, a native of Ireland, who came to America and settled at Dugspur, got himself elected to represent Grayson County in the Legislature in order to form a new county and have it named for himself. His opponent, James Blair of Galax, caused the bill to be passed which provided “that the new county should be called and known by the name of Carroll County, in memory of Charles Carroll of Carrollton” the last survivor of the signers of the Declaration of Independence (January 17, 1842). 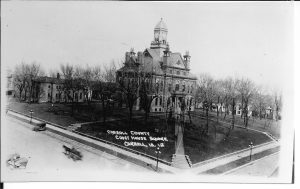 Two years later Representative John Carroll got a bill enacted naming the county seat Carrollton, but the inhabitants continued calling their village Hillsville. Historians disagree as to whom Carroll County [Virginia] honors with its name. There are few authentic records of the early settlers in this vicinity. In 1758, the Austins and the Saunders entered the Old Lead Mines. They and others, founded the settlements of Austinville and Fort Chiswell. The poor soil of Carroll County did not attract early settlers. The earliest inhabitants of this region were Indians. When Indians first came into this area is not known, but some relics found at the Martin Site in Wythe County can be dated to about ten thousand years before Christ. These early Indians were hunters of big game, some of which is now extinct. 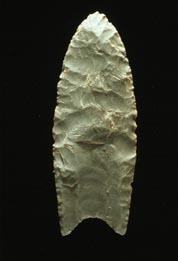 They made spear points of a very distinct type, Clovis Point. They were probably the ancestors of our later Indians. The Indian gave us the plant that saved the Nation – Indian corn. The first settlers to this region were the Scotch-Irish, descendants of the Highlanders who thrived in these high altitudes. They were true pioneer stock – brave, used to hardships and dangers; of superior intelligence, magnificent physique, and nothing could withstand them. There was a co-mingling of English, German, Irish and French Huguenots who also settled this region, but Americans all were they – each bringing his quota of heritage gifts – contributing to the making of a Carroll County native. On the morning of March 14, 1912, Mr. Floyd Allen stood in the Carroll County courtroom to hear the verdict of his peers. Upon conviction of interfering with an officer of the law, Judge Thornton Massie oversaw the jury’s imposed sentence of one year imprisonment. Mr. Allen stood and declared, “Gentlemen, I ain’t a goin’.” Gunfire, chaos, death ensued… all in a moment. Five people died and seven were wounded in the gun battle that followed. A nation-wide manhunt was called for by the Governor of Virginia which lasted six months. Two of the participants were executed and the others received lengthy prison sentences.